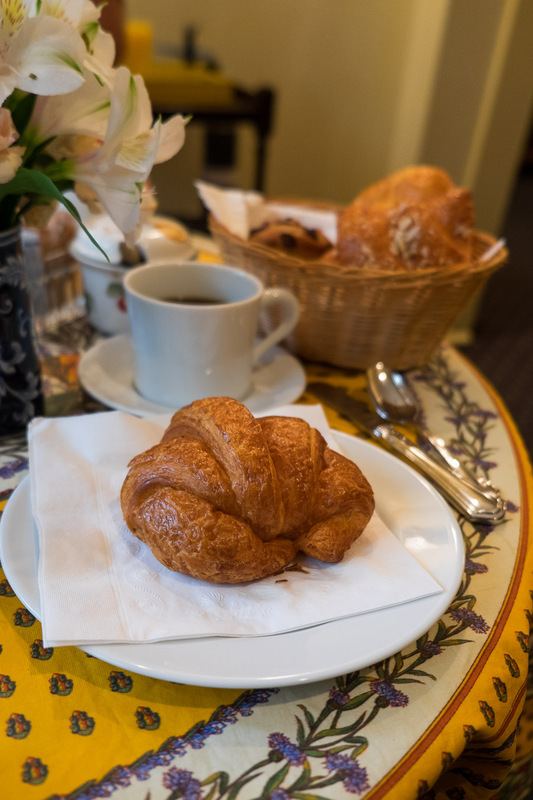 After a good night’s sleep, I joined other hotel guests downstairs in the parlour for breakfast of croissants and muffins with coffee, tea and orange juice. 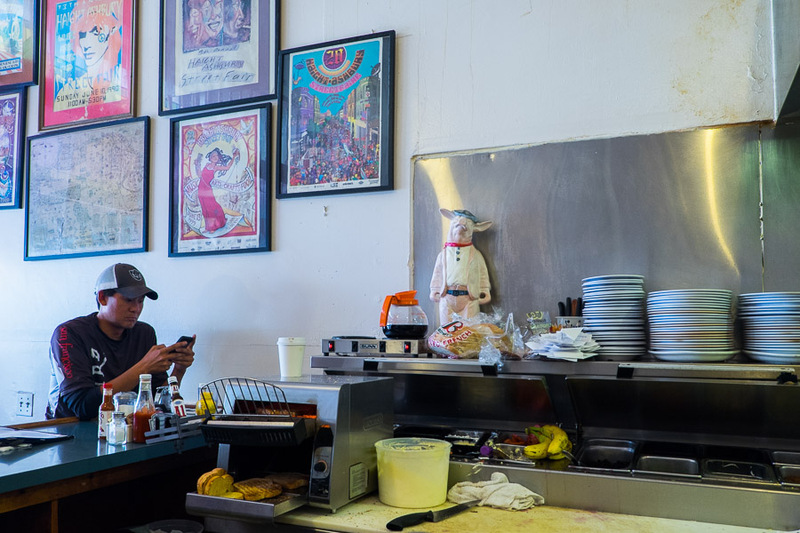 I wasn’t in the mood for idle chit-chat (I am a morning person; I just don’t care for aimless chatter) and out of sheer luck shared the table next to the front window with a quiet couple who smiled and passed the milk jug but didn’t try to engage me in conversation. I’m happy in my own company and don’t get tend to feel lonely when I travel on my own. 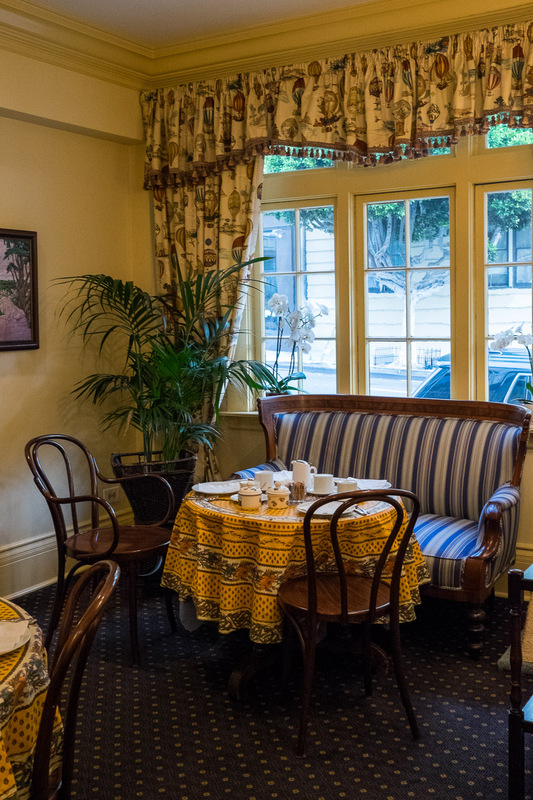 Breakfast in the parlour – I sat at the chair on the left. My croissants and coffee. One bite, pastry flakes everywhere. You’d be able to tell instantly if they didn’t vacuum these carpets regularly! On my way out, I said good morning to Pippin, who was already on front desk duty. I got side-eye and a scowl in return. 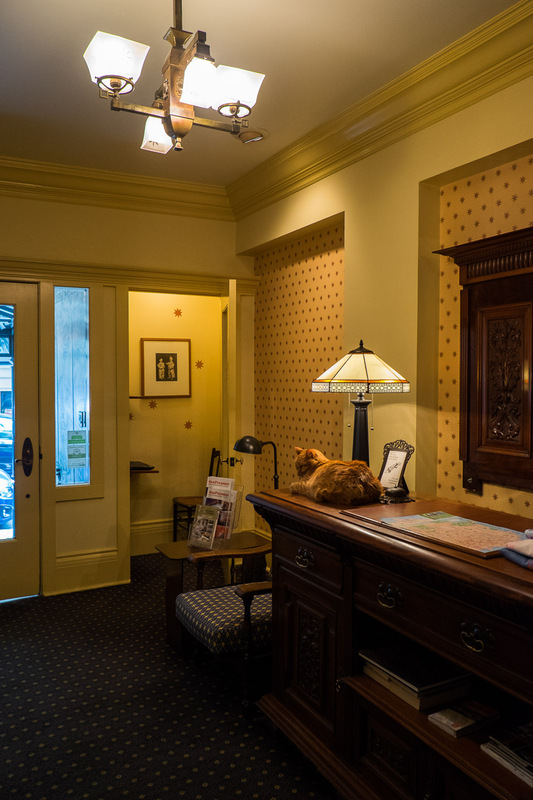 In the little room in the corner is a computer that guests may use for free. I used it to print my boarding pass for my next flight. 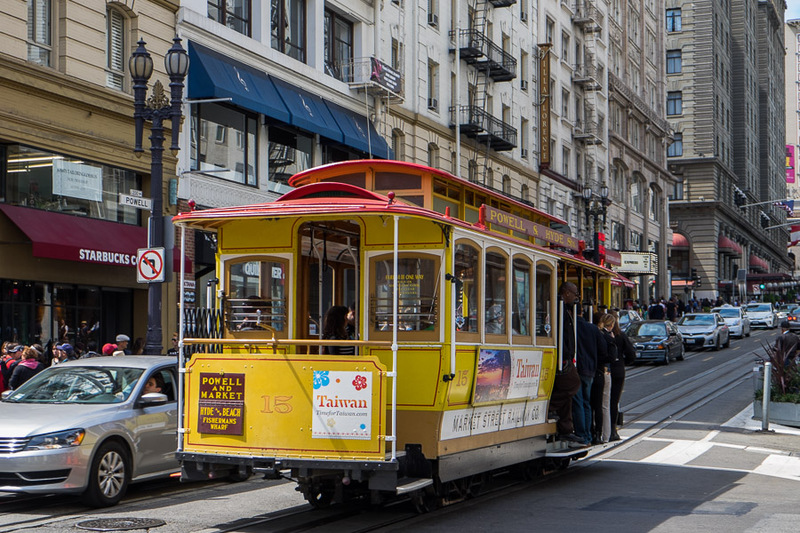 I had booked a seat on a San Francisco hop-on hop-off bus tour via Viator. 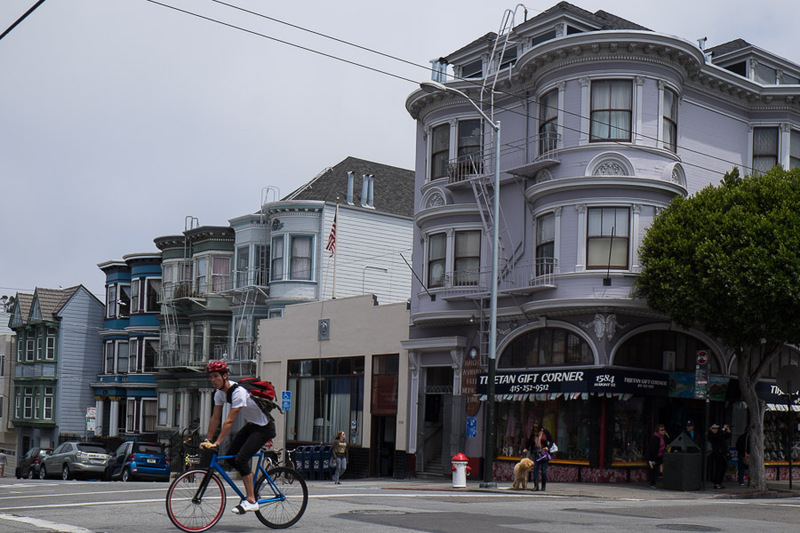 The tour would take me to a number of spots I was keen to check out, including the Golden Gate Bridge and Haight-Ashbury. First stop on the tour was Fisherman’s Wharf, but I decided to go for a longer visit the next day. You can get a 2-day pass that’s valid for two consecutive days if you’d like more time to check out all the stops on the tour. I hopped off and on buses several times; the first tour guide’s commentary was informative but loaded with corny jokes. I liked the second guide’s commentary best – it was interesting and not cheesy. The last guy spoke too loudly into his microphone, was very hard to understand and cracked up at his own unfunny jokes. Luckily I’d booked this as a convenient way to get around and explore the city, not particularly because I needed a guided tour. The hop-on hop-off tour bus. No one sits downstairs! 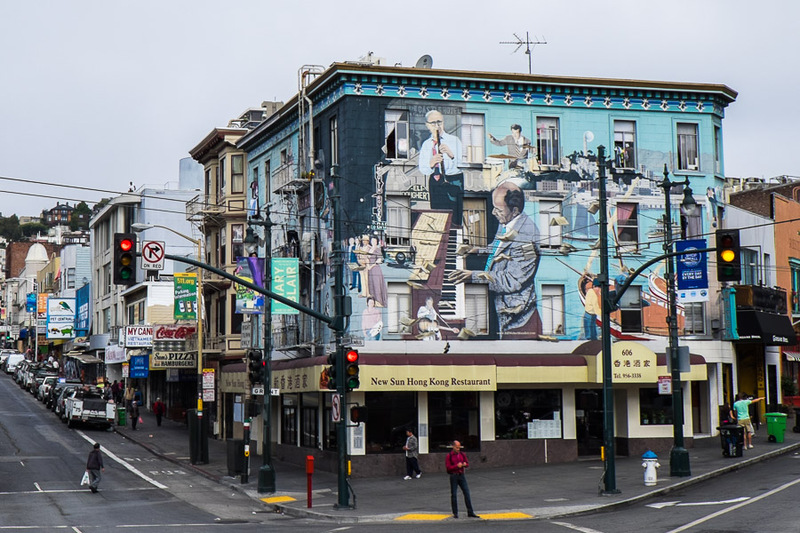 The Jazz mural above the New Sun Hong Kong Restaurant, corner of Broadway and Grant. 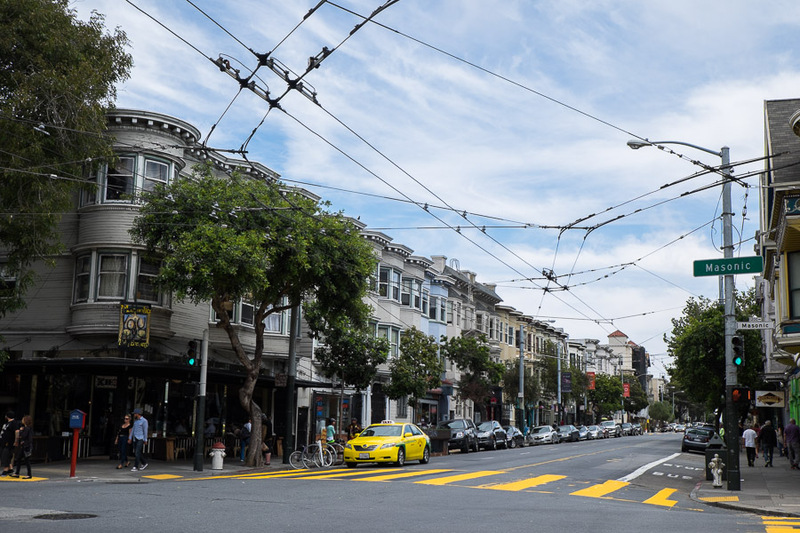 Looks quite different by day (I was here the night before at the conclusion of my North Beach by Night walking tour). You may be able to see the Sam’s Pizza and Hamburgers sign just up Broadway in this picture. 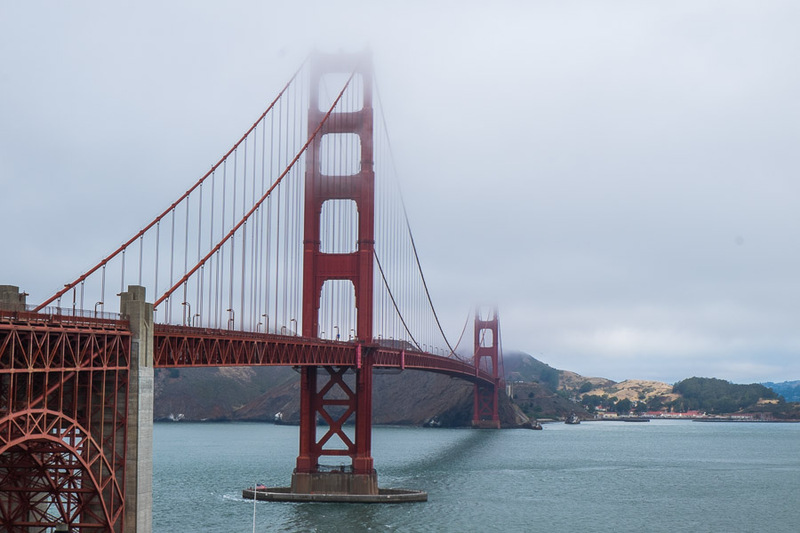 Golden Gate bridge shrouded in typical San Francisco fog. It was extremely windy as well when I took this picture. 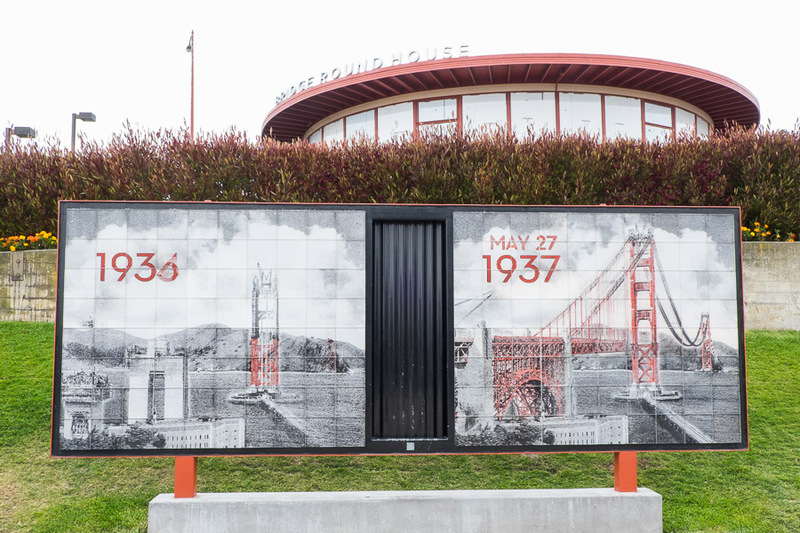 Animated displays present a pictorial history of the bridge and its construction. 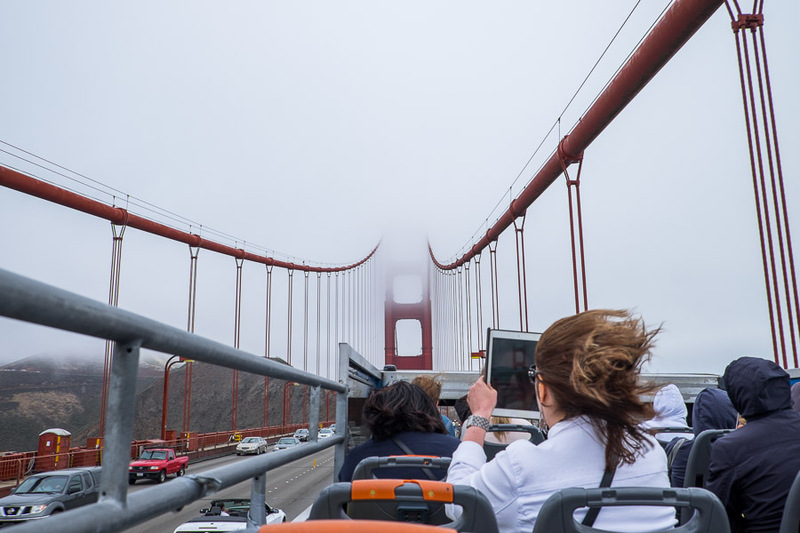 Even on a summer morning, crossing the Golden Gate bridge in an open-air bus was a bitterly cold blustery ride. Luckily I had anticipated this – I brought an extra layer of clothing in my backpack just for this portion of the tour and tied my hair up in a pony-tail. Others on the bus had also rugged up but a couple of women had dressed for a warm sunny day (think summer dresses) and literally shrieked the entire time, huddling together for warmth and trying to hold back their flying hair. 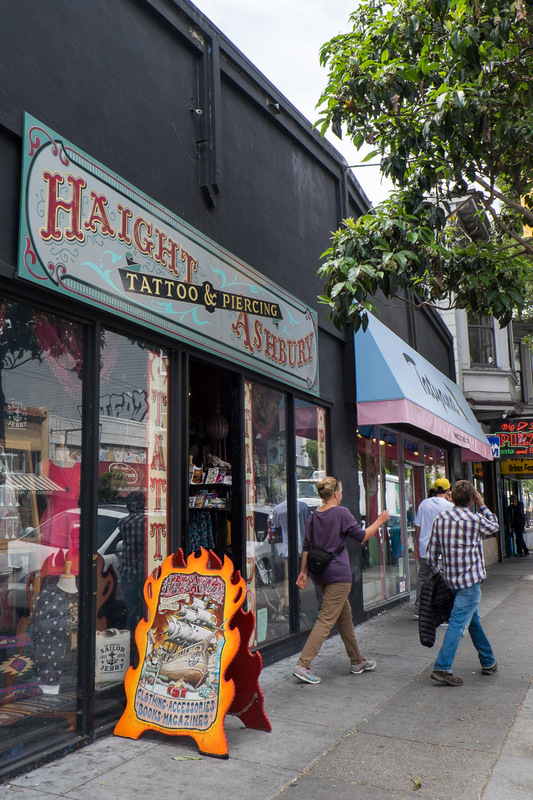 I hopped off the bus to spend some time in Haight-Ashbury, named after the intersection of Haight and Ashbury Streets. 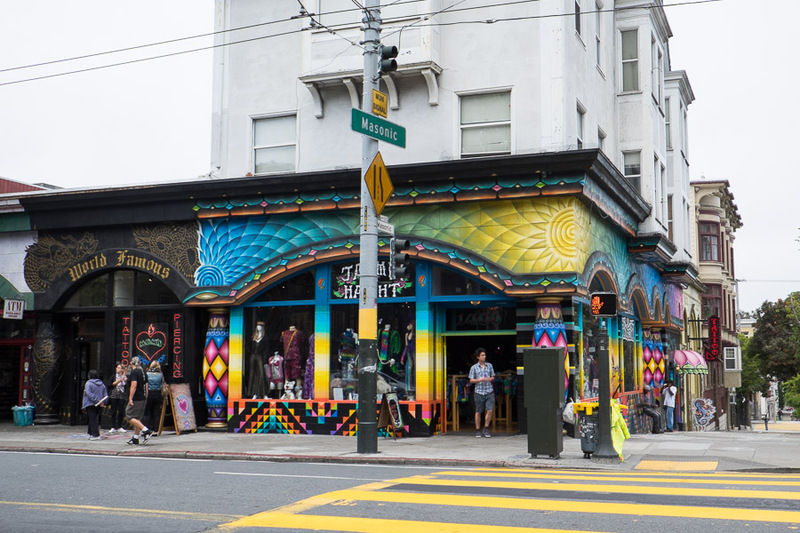 It was the epicentre of hippie culture back in the 1960s and is still known for being somewhat of a hippie district, though these days probably more yuppies than hippies live in the colourful Victorian houses. 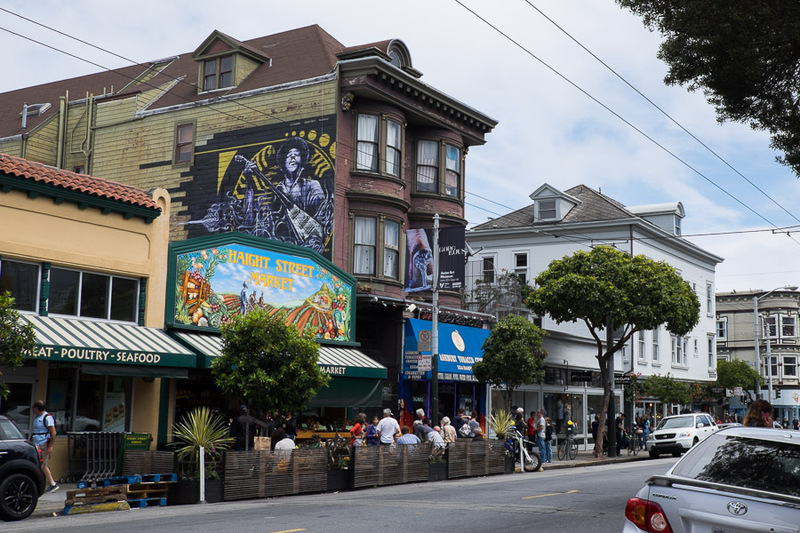 “Jimi Hendrix lived there,” our tour guide said, pointing at a building featuring a mural of Jimi. 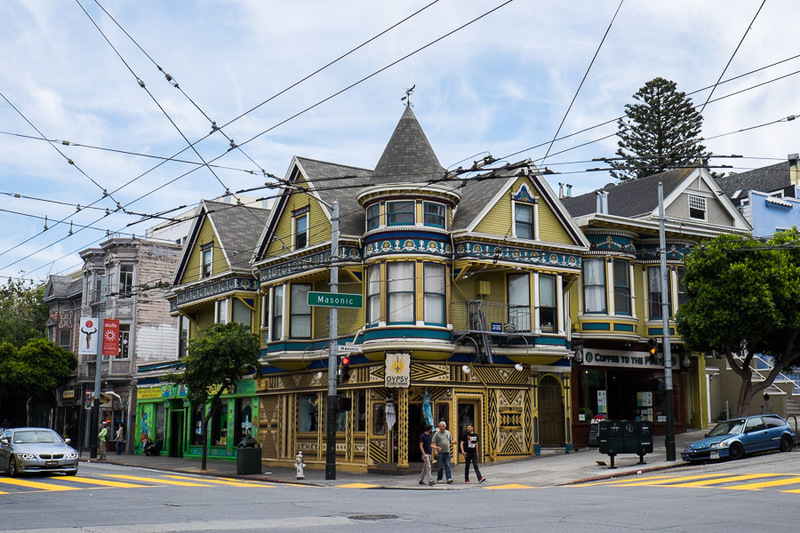 Jefferson Airplane, The Grateful Dead and Janis Joplin were all residents in the neighbourhood. 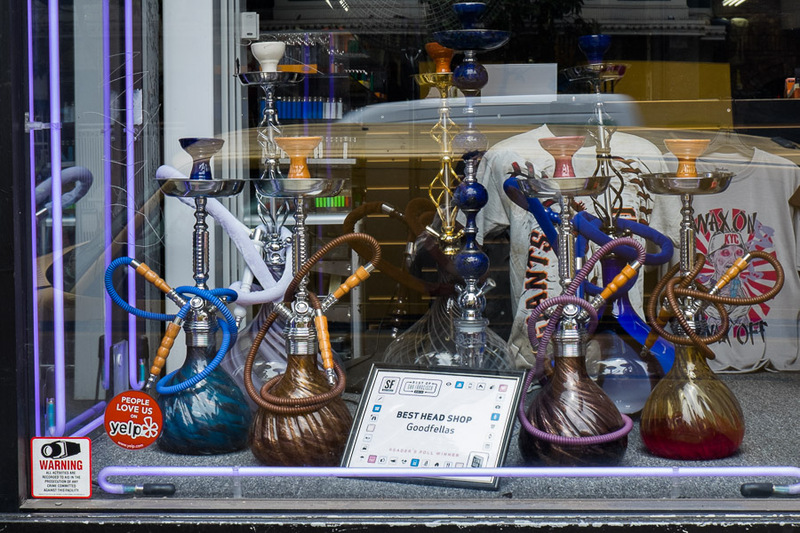 There are peace signs in shop windows, tie-dye T-shirts and rainbow wall art, tattoo parlours and smoke shops (with bongs and all kinds of pipes on display in their windows), but there are also trendy cafes, boutiques and vintage clothing stores. A faint waft of pot hung in the air. 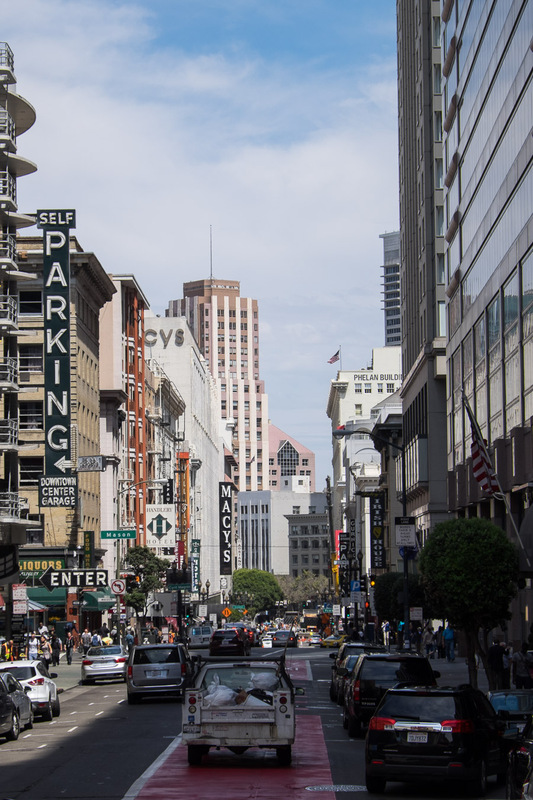 I forgot to mention, by the way – a man offered to sell me pot in Jack Kerouac Alley in Chinatown (I politely declined and kept walking). 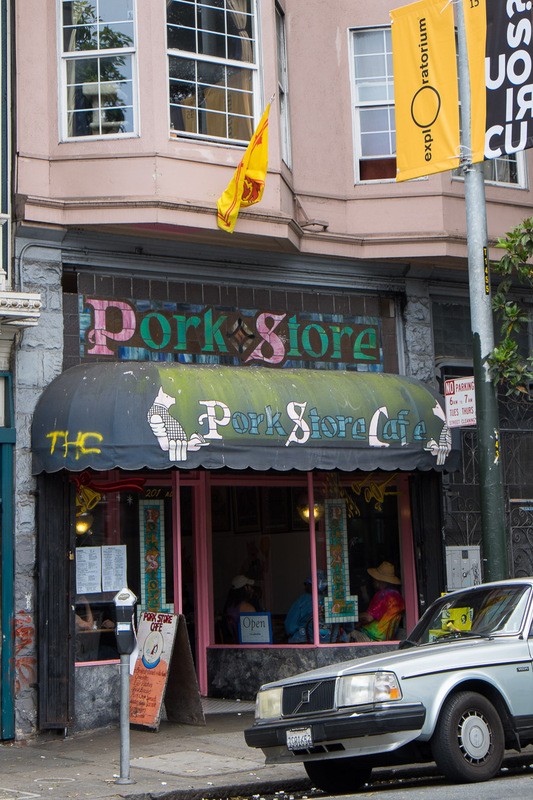 I spotted the Pork Store from the tour bus and knew I had to check it out. It was busy at lunch time but I managed to get a seat at the counter with a great view of the cooks at work. I couldn’t go to the Pork Store and not order pork! 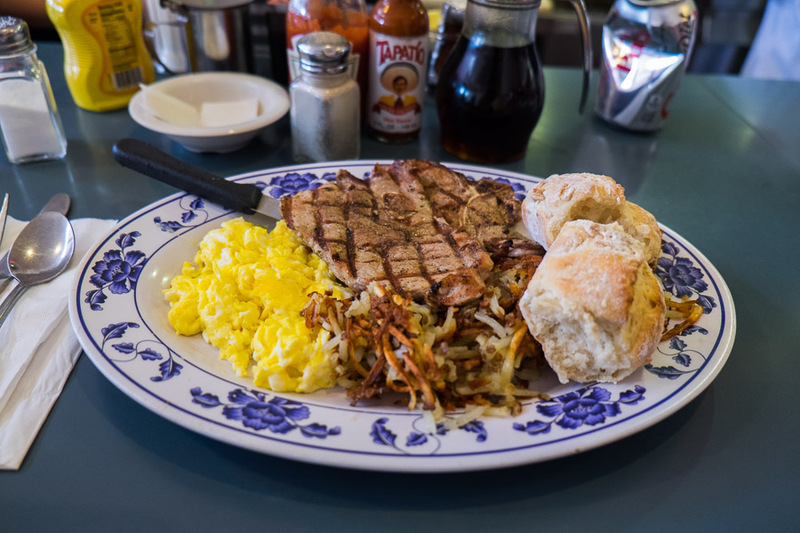 I chose the Pork Store Special – two pork chops with hash brown potatoes, eggs any style (I chose scrambled) and homemade biscuits or toast (I chose biscuits). I watched my pork chops as they sizzled on the grill. 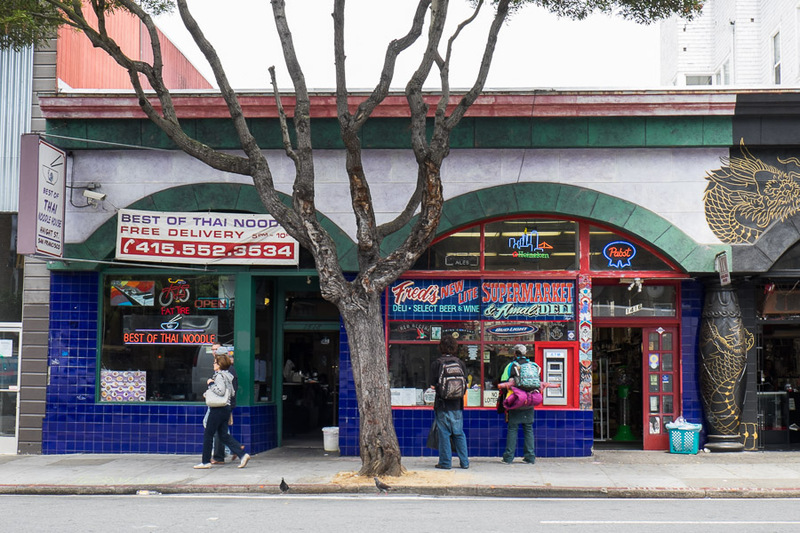 The Pork Store originally opened in 1916 as a butcher and sausage shop which traded until the 1950s. 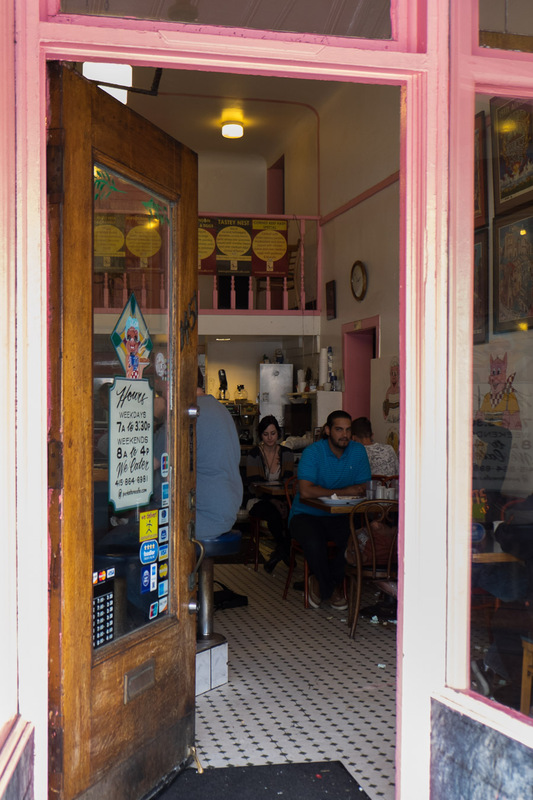 In the years that followed, the shop was taken over by several different businesses and became the Pork Store cafe in 1979. The pork chops were juicy and seasoned well. All around me, plates loaded with pork chops and burgers and hash browns and eggs cooked various ways. I’ve missed American biscuits since I’ve been back in Australia. I ate mine with plenty of butter and grape jelly. 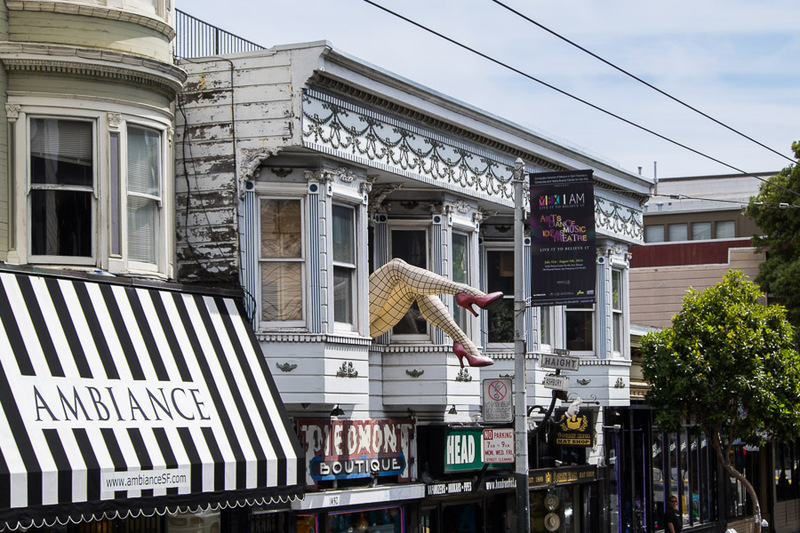 The ‘Haight’ and ‘Ashbury’ street signs are now positioned extra high on the pole as they kept getting stolen. That’s a portrait of young Janis Joplin on the left. 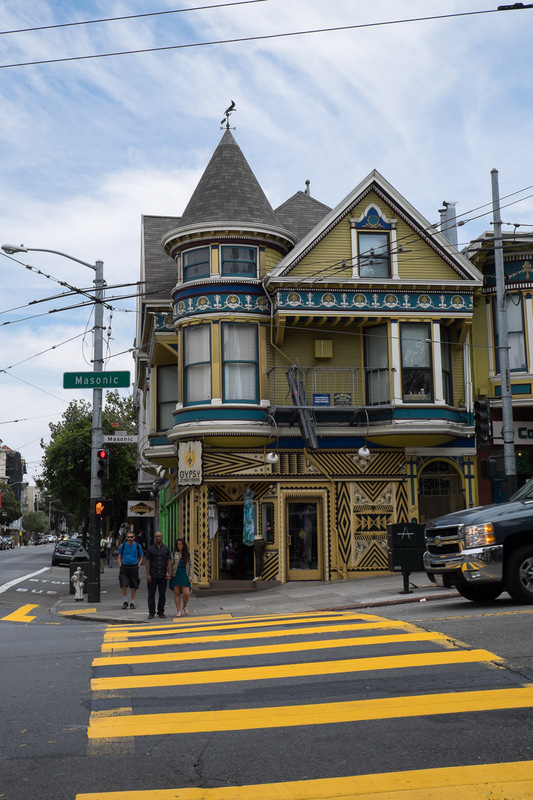 The Painted Ladies are a famous row of Victorian houses on Steiner Street. 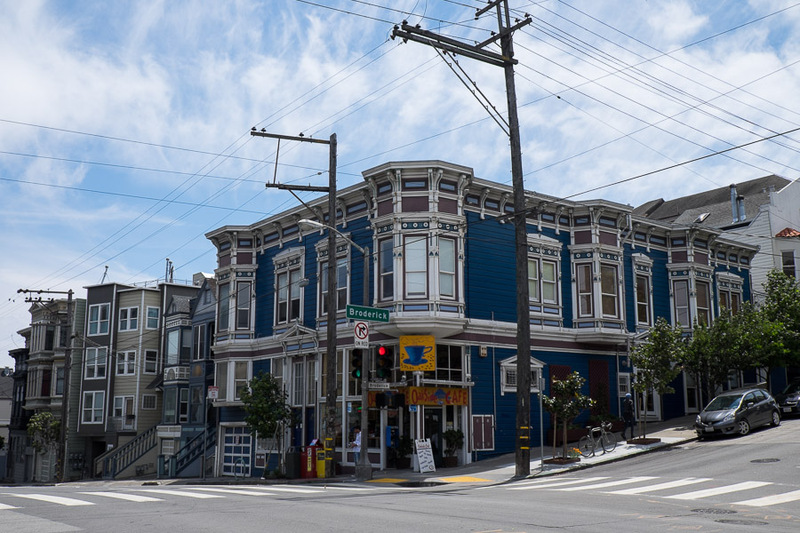 They were featured in the opening credits of the TV series Full House (in the 1980s/90s) and have become San Francisco icons and are on many a photographer’s San Francisco to do list. They were on mine. 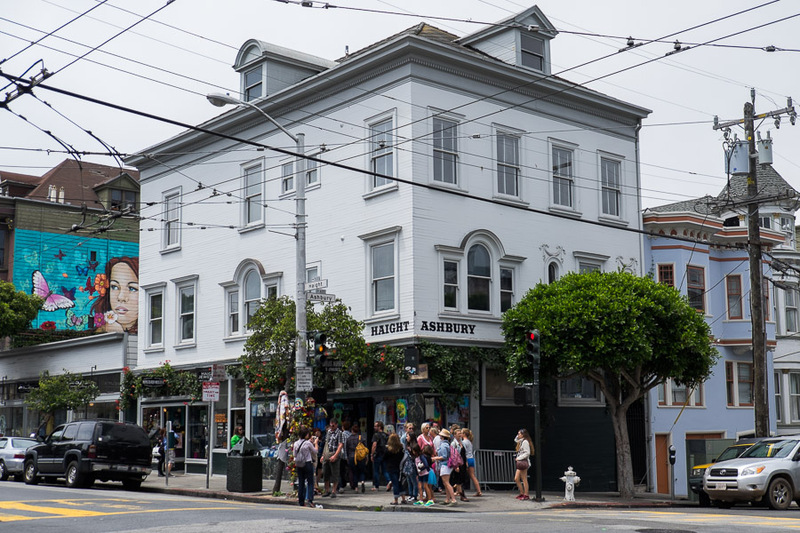 Our bus tour guide explained that their itinerary used to include the Painted Ladies but their occupants campaigned successfully to get their homes taken off the tour bus itineraries. Fair enough, I reckon. 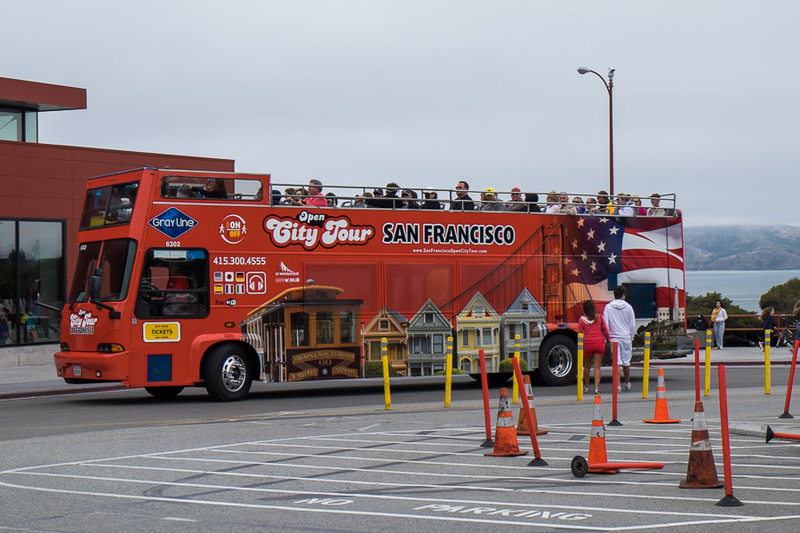 I can only imagine how annoying and intrusive it would be to have double decker busloads of tourists gawking all day with tour guides jabbering over loudspeaker/megaphone. They may be a tourist attraction but they are someone’s homes too. 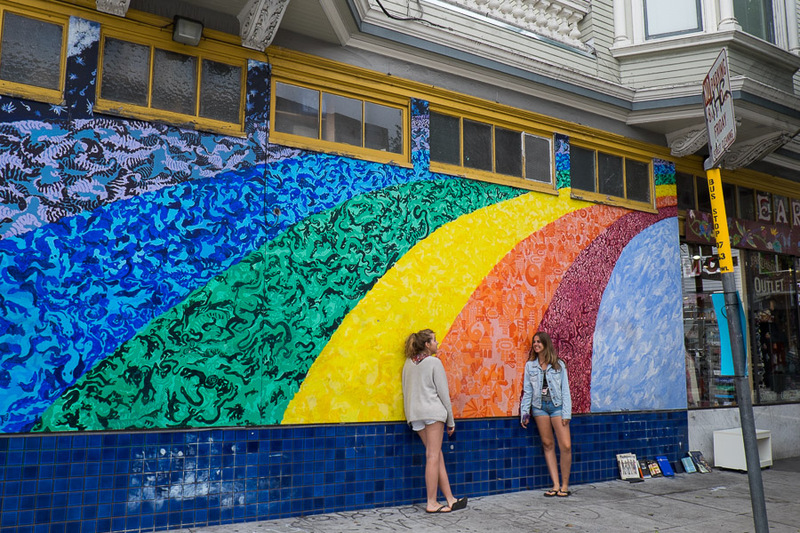 After lunch, I walked from Haight-Ashbury to the Painted Ladies. When I got there, I was dismayed to see scaffolding and shade cloth obscuring one of the Ladies – bad luck for me, not great for a photo! I had similar bad luck when Jac and I visited the Big Pineapple in Queensland years ago, pre-this blog. They were carrying out Big Pineapple maintenance and again, there was scaffolding on one side, and we weren’t allowed to go inside or climb up to the top. Have you had a similar experience, travelling all the way to discover an attraction was closed or unavailable? 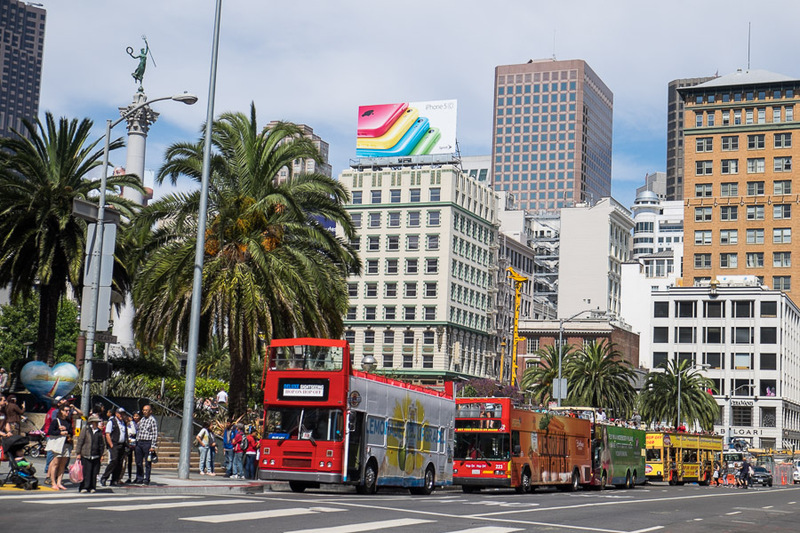 After this, I walked back to the nearest hop-on hop-off stop, got back on the bus and rode back to Union Square to the spot opposite Macy’s which I call ‘Tour Bus Central’ – pretty much all the different hop-on-hop-off bus companies start off their tours from here. 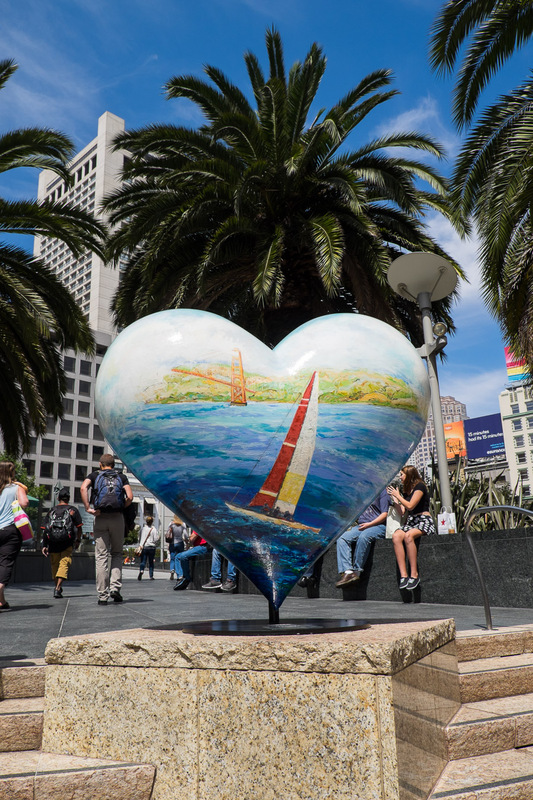 Every year since 2004, Hearts in San Francisco sculptures have been painted by local artists, displayed around San Francisco and then auctioned to raise funds for the San Francisco General Hospital Foundation. 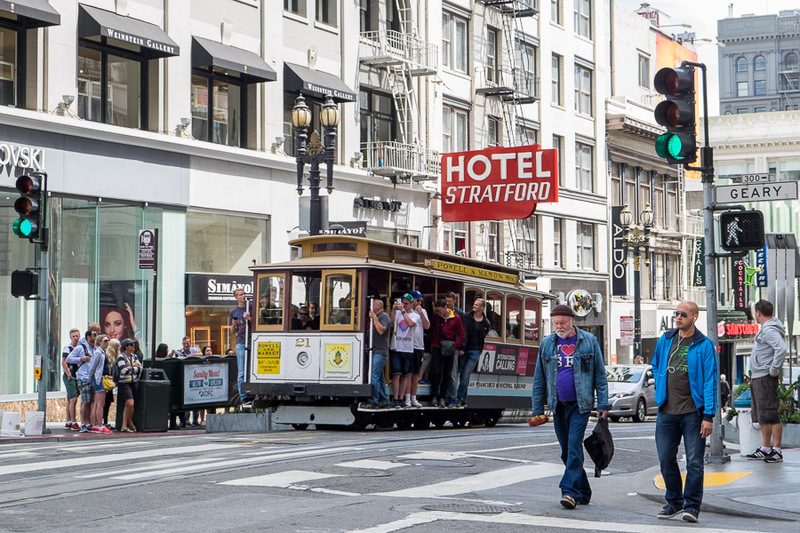 The ‘hearts’ were inspired by Tony Bennett’s song ‘I left my heart in San Francisco”. I had made a booking months ago for dinner at Jardiniere. I’ve been a fan of chef-owner Traci Des Jardins from watching TV shows such as Iron Chef America (she defeated Iron Chef Mario Batali), Top Chef and Top Chef Masters. 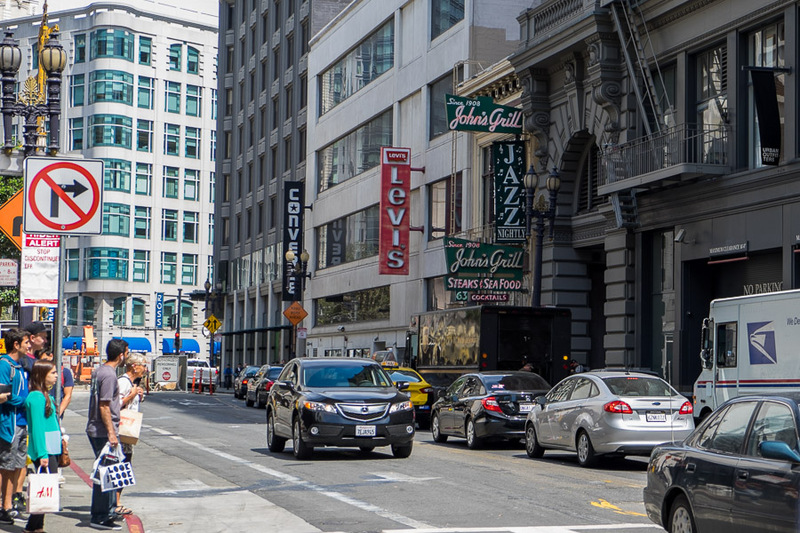 Her French-influenced California fine dining style of cooking looks amazing on TV and I was eager to dine at Jardiniere, her flagship restaurant (she owns several restaurants in San Francisco). 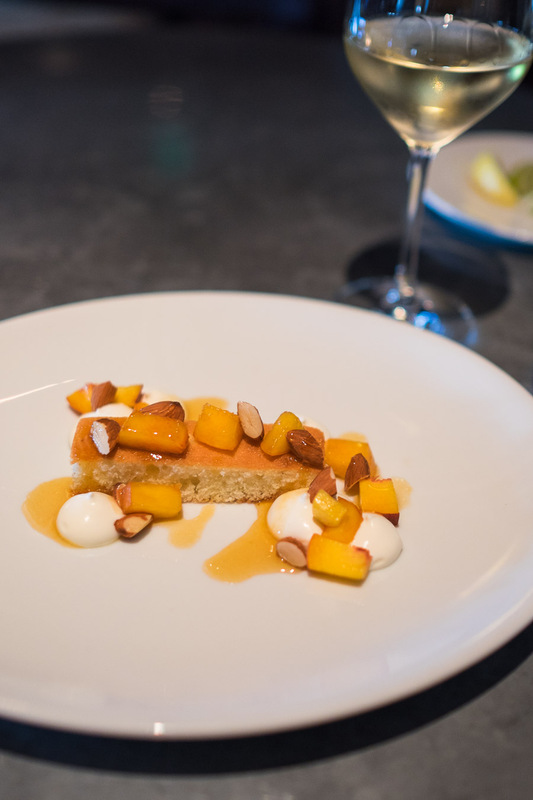 Through my online research I found Jardiniere’s Monday night prix fixe dinner – US$55 for three courses and matching wines, pretty amazing value. 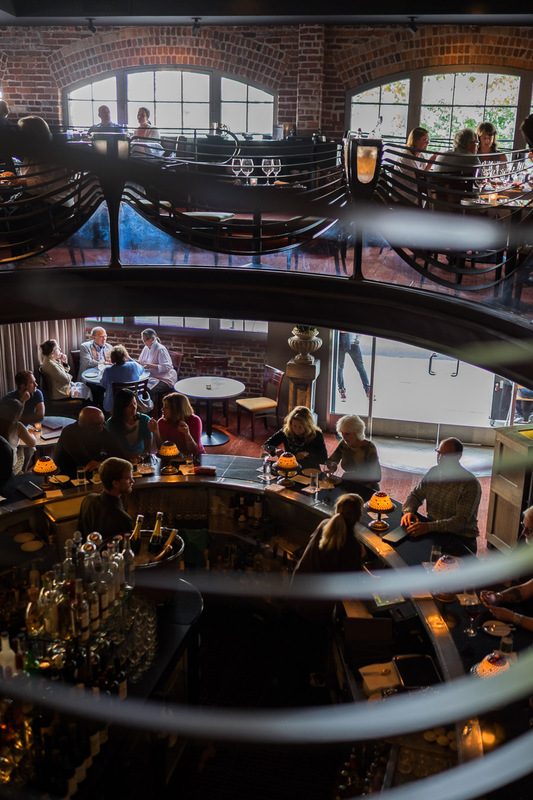 The Monday prix fixe menu changes each week (upcoming Monday prix fixe menus are posted online) and on my Monday it featured matching Mt Beautiful wines from North Canterbury, New Zealand. I was shown to my table upstairs and was almost immediately served a warm bread roll and a cup of rich mushroom broth. Prior to each course being served, a sommelier presented and poured the matching wine. The food was as wonderful as I imagined it would be. 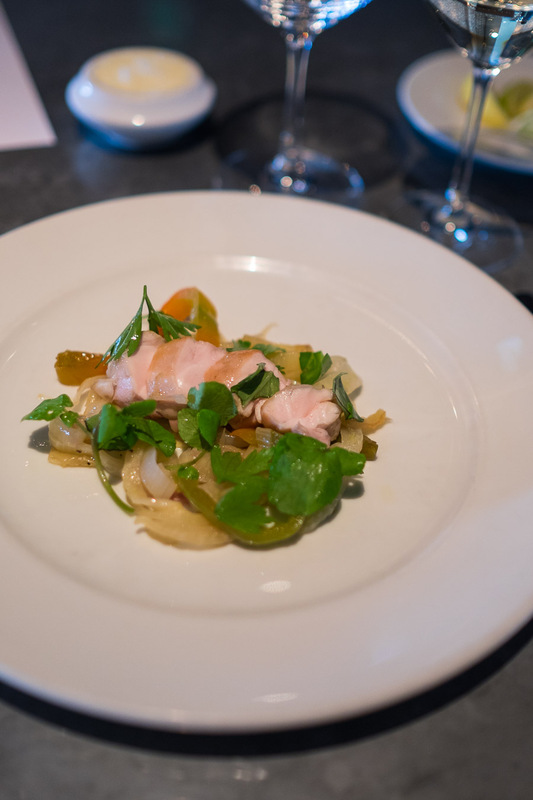 The first course was rabbit escabeche with heirloom pepper, fennel and cress. 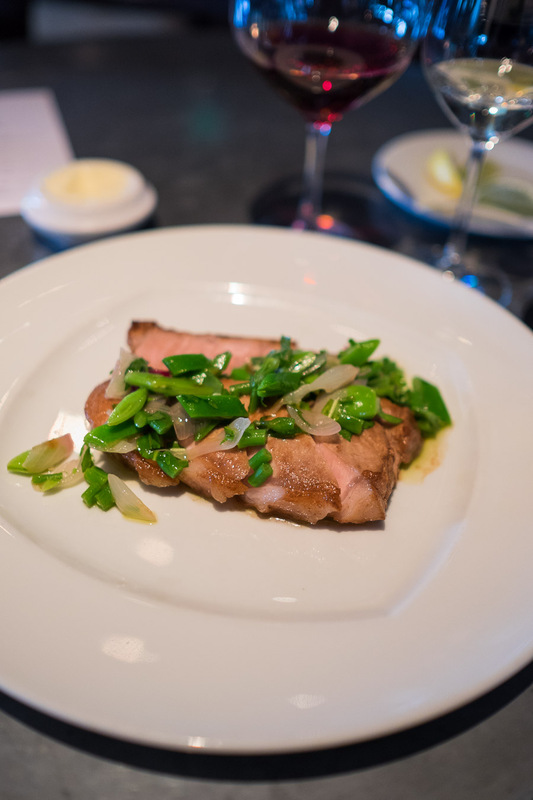 The second course was a succulent pork chop served with blistered bean salsa verde. Poor planning on my behalf to eat two meals involving pork chops in one day, but I really didn’t mind – I love pork chops but don’t eat them that often. Dessert was a slice of almond cake drizzled with peach caramel and served with marscapone, a nice change to cream. Being on my own, I was careful how much of the wine I consumed. I didn’t need to drink a whole lot to feel like I’d gotten my money’s worth. Service was impeccable. The flavours were vibrant, the meats beautifully tender. I enjoyed every bite and left behind clean plates. Coffee and baby macarons were served for an extra $4. Add taxes and my meal came to US$66.73 plus tip. 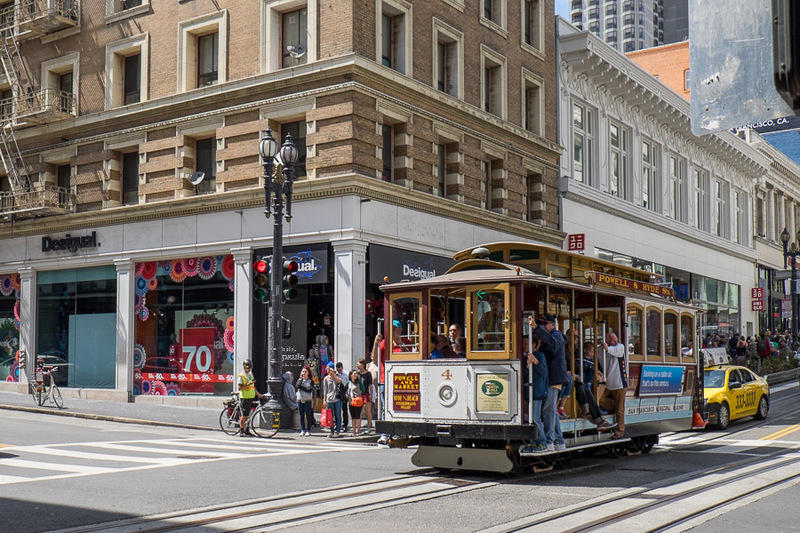 I’d happily return to Jardiniere on my next visit to San Francisco – though I’d also love to try chef Traci’s other restaurants too. I stayed for 4 nights in a queen bed room with private bathroom at US$190 per night plus 16.25% city hotel tax. Read Pippin the cat’s blog: Pip’s Album. Pippin’s got two sisters, Patsy the French bulldog and Cookie the golden retriever but I didn’t meet either of the girls during my stay. 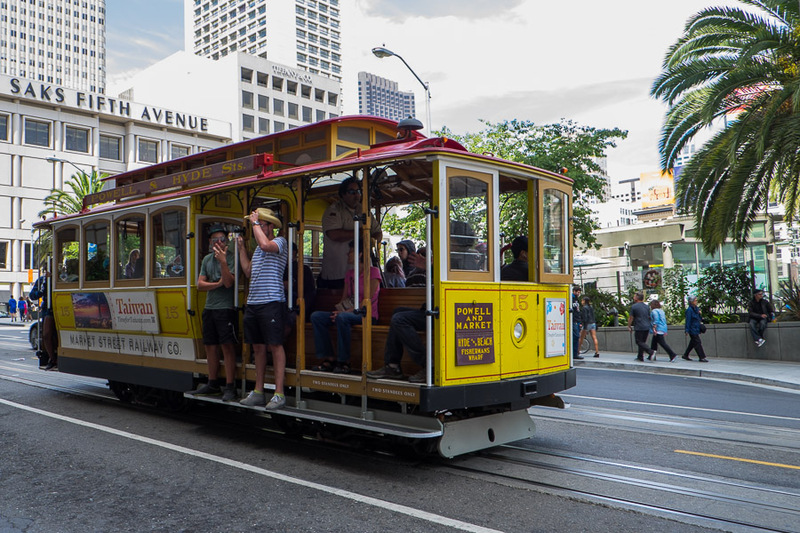 There are many hop-on hop-off bus tours, operated by different companies. It’s a matter of finding one that suits your budget and stops at places you are interested in. 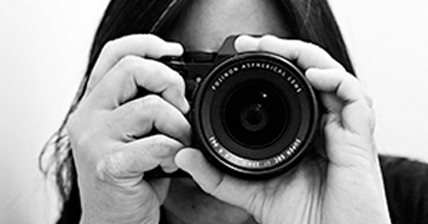 It’s easy to find online reviews of the various tours, if that helps your decision-making. 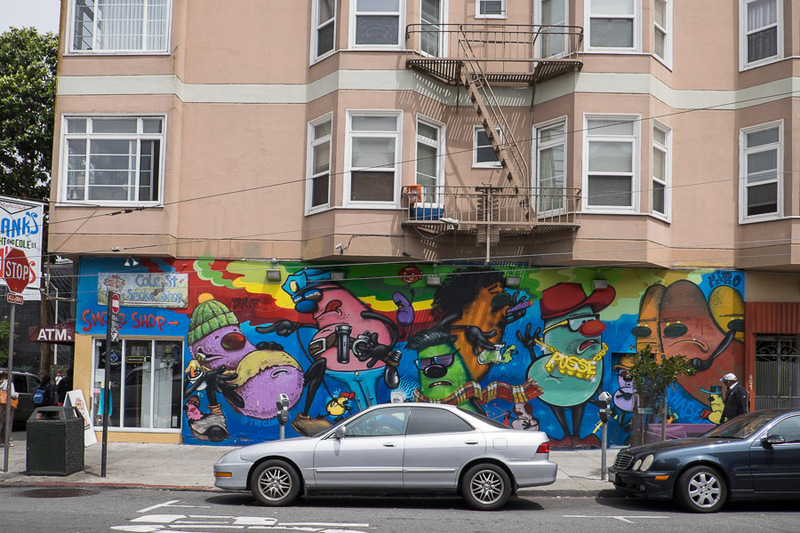 There is a second Pork Store in the Mission District, San Francisco. 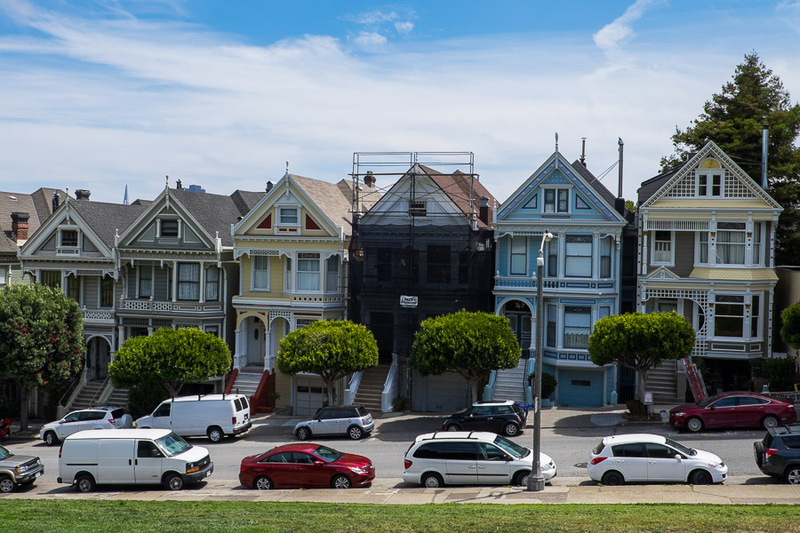 The Painted Ladies are a row of six private residences on Steiner Street, next to Alamo Square Park.